It looked like a turning point in the 1989 season-the 6-4 Bears climb back from a 19-point fourth quarter deficit to pull ahead of Tampa. But it turned out to be the season's last breath as Chicago lost on a last-second field goal. The Chicago Bears entered the 1989 season on the heels of the most successful previous four seasons any team has ever had. From 1985-1988, the team won a world championship, four straight NFC Central division titles, made two NFC Championship game appearances, and won 52 games out of 63. But 1989 would turn out to be a wounded campaign filled with wounded Bears, due to age, attrition, injuries and years of failed draft picks catching up with the team. In the winter of 1989, after San Francisco defeated Cincinnati for their third Super Bowl title, NFL owners and players ratified a new free agency plan. The plan would force teams to designate 37 players as "protected", with the rest becoming free agents able to sign with any team during the months of March and April. The first 1989 winds of change began to blow when the team left long-time veteran Super Bowl champion players Otis Wilson and Mike Richardson unprotected. Al Davis' Los Angeles Raiders signed both players, but neither would make the club that year and would be forced to retire. Another veteran of note unprotected was linebacker/defensive end Al Harris, who signed with Buddy Ryan's Philadelphia Eagles. Changes to the organization and team continued throughout the spring. Longtime offensive coordinator Ed Hughes was "promoted" to the title of Assistant Head Coach, which simply meant that assistant Greg Landry took over as offensive coordinator while Hughes was relegated to coaching receivers. Head coach Mike Ditka announced at this time that that starting quarterback position was up for grabs, meaning incumbents Jim McMahon, Mike Tomczak and 1987 first-round pick Jim Harbaugh would battle for the starting role. McMahon had started the previous NFC Championship game but couldn't muster the team to more than three points, so his long-standing starting job was by no means safe. What was good news for the Bears was that for the second straight season, they owned multiple picks in the first round of the draft. 1988 had brought young offensive talent in receiver Wendell Davis and running back Brad Muster, and in 1989 it was thought that urgent help would be needed on defense, with the loss of Wilson, Richardson and Harris. Additional depth on the defensive line was needed as well, given that William Perry and Richard Dent had missed significant time in 1988 due to injury. Not only did the Bears have two first-rounders in 1989, they actually had three. They owned their own pick, number 25, and also had the 11th pick from the Raiders as part of the 1988 Willie Gault trade, and the 12th from Washington for Wilber Marshall following the 1987 season. On draft day, the Bears selected Clemson cornerback Donnell Woolford 11th overall, then spent the 12th pick on Florida defensive end Trace Armstrong. Feeling good about the first two picks, and needing additional depth, the Bears traded the 25th pick to the Miami for the Dolphins' high second and third-round picks. Additional wheeling and dealing gave the Bears a whopping 20 selections over the draft's 12 rounds. Roughly eight of those players made the team and contributed. One that didn't was ninth-round pick Byron Sanders from Northwestern. Byron's brother Barry had been selected by the Detroit Lions with the third overall selection, and went on to slightly more acclaim during his career. In Armstrong, Woolford and the John Roper, a linebacker selected with the second-round pick obtained from Miami, the Bears had their replacements for Wilson, Richardson and Harris. Chicago used the other pick obtained from Miami on offensive lineman Jerry Fontenot. Were it not for the two picks obtained from the Dolphins, and the two first-rounders the Bears would have had virtually nothing long-term from this twenty-player draft. But it wasn't the 1989 draft that would harm the 1989 Bears-although the '89 draft would have a lot to do with the demise of the team leading up to Mike Ditka's dismissal three years later. One of the nails in the '89 coffin were failures high in the 1985-1988 drafts. A second-rounder was blown in 1985 on cornerback Reggie Phillips, released in 1988. 1989's second 2nd round pick was tackle Dave Zawatson, who didn't make the 1990 roster. Third-round busts were James Maness in '85, David Williams in '86, the pick traded for Doug Flutie in 1987, and Ralph Jarvis in '88. Fourth-round picks such as Paul Blair ('86) and Sean Smith ('87) weren't much better. The 49ers built their late-decade dynasty around middle-round picks like Tom Rathman, Charles Haley and John Taylor during those years, while the Bears failed to restock as the Super Bowl team aged. This, along with letting Pro Bowlers like Marshall and Gault leave, would force their ultimate downfall for more than a decade. Training camp 1989 opened with the usual holdouts that were common in the 1980's, even though without true free agency players had no real leverage. Steve McMichael held out briefly in hopes of renegotiating the contract he had signed the previous season, and William Perry, Dave Duerson and Shaun Gayle missed several days before signing. The most notable holdouts were the first round picks, Armstrong and Woolford. The former missed the first three weeks of camp, while the latter didn't sign until after the first preseason game. These holdouts would trigger a unique change in Bears draft philosophy the following season. Prior to the season when asked about Jim McMahon's status, Ditka said the Bears had not shopped McMahon and had no intentions of trading him, but would have to listen to offers if anyone called. This was obviously a smokescreen, as Armen Keteyian reported in his 1992 book Monster of the Midway on Mike Ditka that McMahon asked his agent Steve Zucker to seek out trade before the mud came off his cleats after the 1988 NFC Championship loss. It is anyone's guess who called who, but McMahon was ultimately dealt to San Diego just days before the Chargers traveled to Soldier Field for a preseason meeting with the Bears. Chicago received a third-round pick that upgraded to a 1990 second-rounder based on the quarterback's performance. McMahon's parting words were that the Bears were doing their best to dismantle the Super Bowl team, and he was correct. Harbaugh would create a stir several years later by accusing Tomczak of relaying playcall hand signals to McMahon on the opposite side of the field during that preseason game, bringing to the surface a rift that always existed between the three former teammates. Very shortly after the McMahon trade, Hughes retired from the team, stating that coaching just wasn't fun anymore. He stated for the record that losing McMahon didn't have anything to do with the decision, but the former offensive coordinator was a staunch McMahon supporter, and his words didn't convince anyone. With McMahon gone, Tomczak started the season at quarterback, with Harbaugh backing him up. Ditka felt good enough about the duo that he didn't keep a third quarterback on the active roster. Seventh-round pick Brent Snyder from Utah State, a native of Joliet, IL joined the practice squad, a new group in the NFL that season. First up for the Bears and entrenched starting quarterback Tomczak in 1989 were the defending NFC Champion Cincinnati Bengals at Soldier Field. It was the defending AFC Champs versus the NFC runners-up, and the Bears endured 20-17, despite Tomczak throwing an interception on his first pass attempt of the season. Defensive lineman Dan Hampton, playing in his eleventh season, sacked Bengal quarterback Boomer Esiason twice and blocked a field goal attempt. He also displayed refreshing candor in his postgame interview. Asked to comment on fullback Brad Muster's fumble with 1:29 left in the game, Hampton said "if I had a knife, I would have stabbed him." The following week Chicago hosted the Minnesota Vikings, who had swept the Bears the previous season. The Bears and Vikings stayed close the first three quarters, with Chicago holding a 10-7 fourth-quarter lead. In the final period, the Bears busted out with four touchdowns, ultimately beating the visitors 38-7. The Bears moved to 3-0 with a win in the season's third week at Detroit, a game in which the offense racked up 542 net yards and 47 points. The Bears' expected strong start set up a miracle matchup for ABC's Monday Night Football, as the 2-1 Eagles traveled to Soldier Field to face the undefeated Bears. The week preceding the game was filled with the drama of the Ditka-Ryan rivalry. Despite brash talk from Ryan, the Bears prevailed 27-13 and embarrassed the visitors on many fronts. Ditka used his usual sarcasm following the game, stating "I'm not surprised (about the 4-0 start), but I think a lot of people must be surprised, that we beat Cincinnati, Minnesota, Detroit and Philadelphia. We must be awfully lucky." As good as the Bears had looked in the season's first four weeks, the fifth week would begin to show the cracks in the team's facade. The veteran Hampton started and played in the Eagles' game, but after which it was revealed he would be traveling out of state to have his knees, which had already endured countless operations, scoped. The loss of Hampton would turn the fortunes of the Bears' 1989 season, and its most dramatic event would not be revealed until the 2005 release of John Mullin's book The Rise and Self-Destruction of the Greatest Team in History. Uncharacteristically for the 80's Bears, following the 4-0 start, the team suffered three straight losses for the first time since 1981. At Tampa in week five, the Bears lost to the Buccaneers for the first time since the 1982 season, 42-35. The following week against Houston in Chicago, they fell again 33-28, despite leading by nine points with less than five minutes remaining in the contest. And the following week at Cleveland they lost 27-7 on Monday Night Football, failing to reprise their evening strength as they had against the Eagles at home. Defensive line depth was at the crisis point as reserves John Shannon and Tony Woods had to start at the defensive end positions. Following the Cleveland loss, with the Bears at 4-3 and hanging on to hope, according to Mullin, Ditka approached Hampton and asked if he was going to play or just sit out the season. Hampton responded that he had no contract the following season, and if not for some pledge to secure at least one more year's salary, he didn't feel he could risk completely wrecking his knees. Ditka then took Hampton in to see team President Michael McCaskey. Ditka and Hampton explained to McCaskey that the defense felt Hampton was vital to any chances of resurrecting the season. Indeed, they had gone 4-0 with Hampton and 0-3 without him. Even playing injured against Philadelphia made a difference. Hampton offered to play the rest of the year injured if McCaskey would sign him for one more year at the same salary he was making in 1989. McCaskey refused, and Hampton had no choice but to rest the remainder of the season. Hampton was clearly the key injury that impacted the 1989 season, but he was by far not the only injured Bear. In actuality only two members of the defense-Mike Singletary and Steve McMichael-started all 16 games for the team. Even without Hampton, the Bears would win two of their next three to run their record to 6-4 with six games remaining. Sandwiched in the middle of the stretch was a trip to Green Bay to face the Packers, which they had beaten eight straight times. With seconds remaining the Bears led 13-7, but Packer quarterback Don Majkowski threw a touchdown pass to Sterling Sharpe to tie the game. It was immediately ruled that Majkowski was over the line of scrimmage when he threw the pass, but the ruling was reversed by instant replay on the most questionable replay reversal in replay's history. For years, the Bears' media guide carried an asterisk that read "instant replay game" in protest. 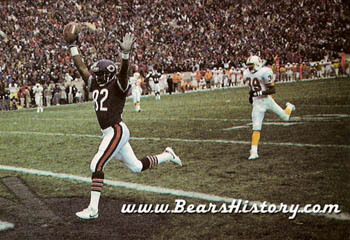 After beating the Pittsburgh Steelers 20-0 on November 12th, the 6-4 Bears hosted the rematch of the Buccaneer series. Behind Harbaugh, now the starter, the Bears fell behind 29-10. In the fourth quarter, Tomczak entered the game and threw three touchdown passes, giving the Bears a late 31-29 lead in dramatic fashion. But true to their 1989 form, the defense gave up one more scoring drive and Chicago lost, 32-31. The next week the Bears lost 38-14 at Washington, and Ditka was livid. He declared that Woolford, his top rookie cornerback, couldn't cover anyone, and predicted his team wouldn't win another game that season. He was correct. The 1989 Bears lost their final six games, and the season ended with a 26-0 blanking at the hands of the eventual Super Bowl champion 49ers. During the season, McCaskey declared publicly that his coach didn't require any sort of vote of confidence from the owner. "I definitely want him back next season," he said. Historical quotes courtesy Chicago Tribune and Chicago Bear Report archives. Quote of the Year: "You don't throw away all he's accomplished in five years because of a rough couple of months." -Team President Michael McCaskey on Ditka in December 1989. Yet in 1992, McCaskey would do just that. Are Bears good or bad? Passing: Mike Tomczak- He entered the season as the unquestioned starter, but did yield to Jim Harbaugh for five starts. Tomczak threw for 2,058 yards and a 68.2 passer rating. Rushing: Neal Anderson- Anderson made the Pro Bowl for the second straight year, and turned in the best season he ever would, rushing for 1,275 yards and 11 touchdowns. Receiving Yards: Dennis Gentry- The sometimes running back/sometimes receiver/always returner led the team with a paltry 463 yards receiving on 39 catches. Anderson surpassed his reception total by 11 catches. Scoring: Neal Anderson- It's rare when a non-kicker leads the Bears in scoring, but in 1989 Anderson did, with 15 total touchdowns and 90 points. Sacks: Richard Dent- Dent turned in another strong year as one of the league's best pass rushers, with 9 sacks. Interceptions: Lemuel Stinson- Stinson foreshadowed a strong 1990 to come, leading the team with 4 interceptions. In 1989 there were so many changes at the starting positions on both sides of the ball, it's hard to list them all. So we'll just list the usuals. Offense, left to right: Mike Tomczak, Neal Anderson, Brad Muster, Wendell Davis, Dennis Gentry, Jim Covert, Mark Bortz, Jay Hilgenberg, Tom Thayer, Keith Van Horne, Jim "Robocop" Thornton, Kevin Butler. Defense, left to right: Richard Dent, Steve McMichael, William Perry, Trace Armstrong, John Roper, Mike Singletary, Ron Rivera, Donnell Woolford, Dave Duerson, Shaun Gayle, Vestee Jackson, Maury Buford. Picks that worked: Donnell Woolford (CB, 1), Trace Armstrong (DE, 1), John Roper (LB, 2), Jerry Fontenot (C, 3), Markus Paul (S, 4), Mark Green (RB, 5). All of these players would play critical roles in Ditka's final four seasons. But only Fontenot and Woolford lasted six years with the team. A short-term success: Eighth-round tackle Chris Dyko filled in for starting right tackle Keith Van Horne when injured, but didn't last to 1990. An absolute bomb: Second-round tackle Dave Zawatson never saw the field for the Bears and was off the roster the following season. Second-round picks can't be blown, but it wouldn't be the last time the Bears would blow one or two in the same draft. Low-rounders that didn't last: The rest of the class. However, if the 1989 draft was judged by trying to reassemble whole college teams, the Bears would have brilliantly succeeded. They chose two players each from five schools: Notre Dame, California, Texas A & M, Arkansaas and Oklahoma. Third-year quarterback Jim Harbaugh, probably harassed daily by good friends Jim McMahon and Mike Tomczak, quickly showed he wasn't one to be pushed around at training camp. Dennis McKinnon once questioned one of Harbaugh's passes at practice, and the quarterback promptly punched him in the face. Rookie first-round picks Trace Armstrong and Donnell Woolford held out of training camp, and the next year the Bears would not draft safety Mark Carrier unless he would agree to a contract before being selected in the top ten. This was directly a result of the '89 rookies holdouts. Defensive back Maurice "MoDee" Douglass was suspended four games for violating the NFL's steriods policy. Douglass claimed he unknowingly had received shots to treat an injury earlier that year. Prior to traveling to Minneapolis to face the Vikings in December, the Bears stayed for three days at the University of Wisconsin at Madison to practice in their indoor facilities, as the Bears had no indoor facilities of their own until the mid-1990's. Many Madison residents protested the university allowing the Chicago Bears of all teams to train during the season in Wisconsin. What had to be the most stirring story around the NFL in 1989 was the Herschel Walker trade. New Dallas Cowboys coach Jimmy Johnson stunned his team's fans by trading away perhaps the Cowboys' only good player, to the Minnesota Vikings. The trade occurred on October 12th of that year, and is still fodder for critics as trades like this will never happen again in the NFL. The Cowboys sent Walker, two third-round picks, two fifth-rounders and a tenth-rounder to the Vikings. In return, the Cowboys received a remarkable 13 picks and players, including three first rounders (in 1990, '91 and '93), three second-rounders (1990-1992), a third, and a sixth. Dallas parlayed these picks into Emmitt Smith, Darren Woodson, and others. In the NFC Central, both the Vikings and the Green Bay Packers finished 10-6, but the Packers missed the playoffs on a tiebreaker. San Francisco ran roughshod over the league with a 14-2 record, and won Super Bowl XXIV in New Orleans, 55-10 over the Denver Broncos. DE/LB Al Harris left unprotected, signs with Philadelphia. LB Otis Wilson and CB Mike Richardson left unprotected, sign with LA Raiders.